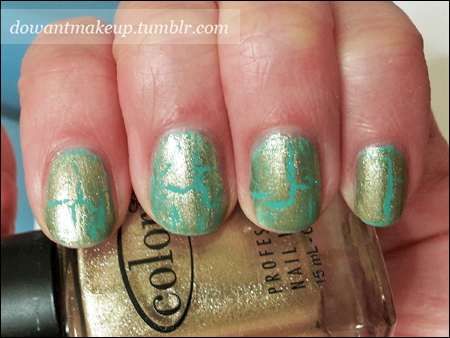 Orly Artificial Sweetener • FingerPaints Hue Left A Message? 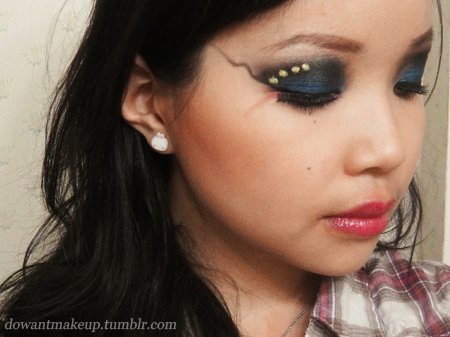 I’ve been wanting to do a glitter gradient ever since I saw this one in grey! 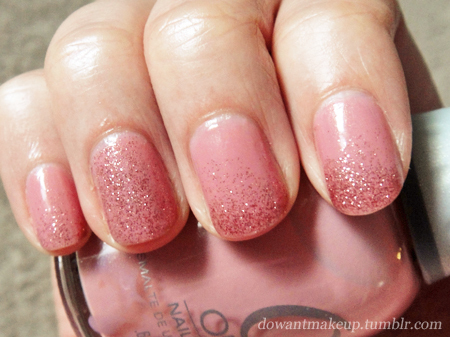 Artificial Sweetener is from Orly’s new-ish Cool Romance spring collection. From the colour in the bottle, I expected a soft mauve-y pink, but true to its name, it is a sweet, cool-leaning pink that makes me think of Barbies and cotton candy. Comparing it to another pink that tricked me, True Colors Pleasures, Artificial Sweetener is softer-looking and not as cool. 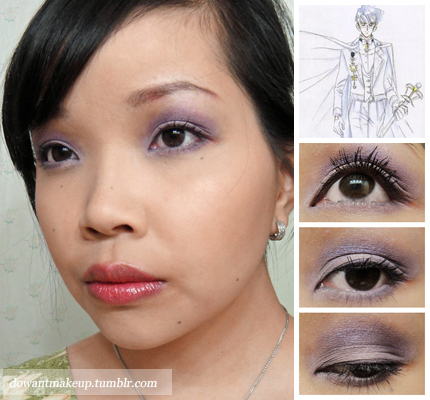 I realized only after I chose my characters for the Sailor Moon makeup collab that I seem to have a soft spot for relatively minor characters, haha. 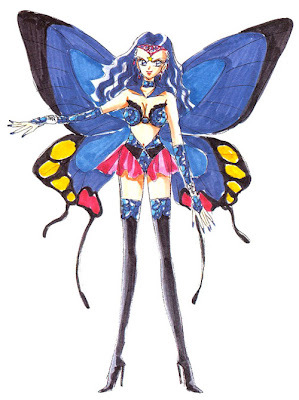 First Neo-King Endymion, now Sailor Heavy Metal Papillon, who only appears very briefly in the manga before getting destroyed by Sailor Chibi Moon and the Amazoness Quartet. She extinguishes the remnants of Sailor Senshi taken over by Galaxia, which take the form of ethereal butterflies. All that aside, I pretty much picked her because I thought her design was interesting and would be a fun challenge to translate to makeup. I really wish I had built up UD Zero to a deeper black. It photographed lighter than I expected. 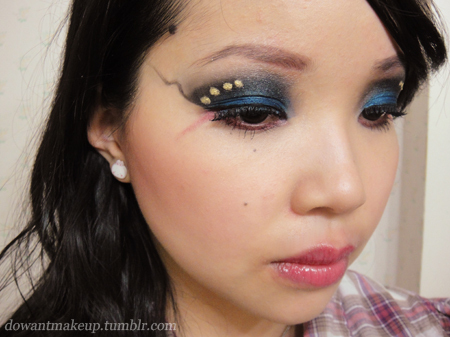 Backstory: So a handful of bloggers decided to do two Sailor Moon-inspired looks each: one after a hero/good guy and one after a villain. 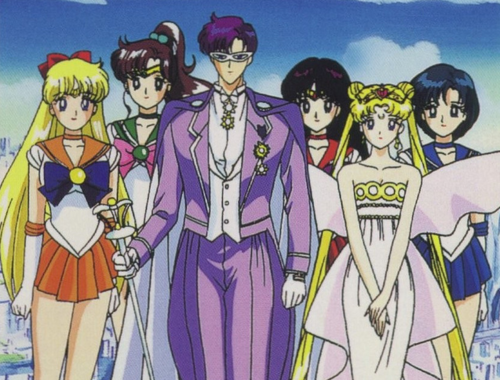 I joined the collab a little late in the game after my favourite characters were already taken, and I ended up rolling with the only non-Senshi of the group for the good guy look, King Endymion. 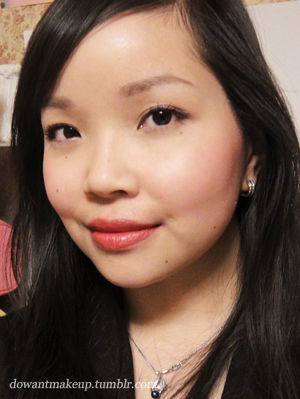 First FOTD in a long, long while :> Please see my review on this lipstick for a more accurate idea of its bright yet deep (and super-hot) red. Attention: Lise Watier launched a contest in honour of International Women’s Day on March 8: not only will Lise Watier put $1 towards Lise Watier Foundation (which provides financial assistance and a supportive environment to girls and women) for every photo of a kiss sent in, but your photo has a chance to win you a Haute Couleur High Coverage Lip Lacquer. Please consider submitting your picture—all it takes is a quick snap and post from your phone! 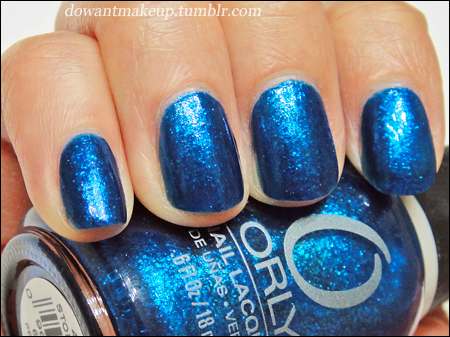 Orly Stone Cold is an eye-popping jewel-toned blue packed with very fine glitter (flakie?) 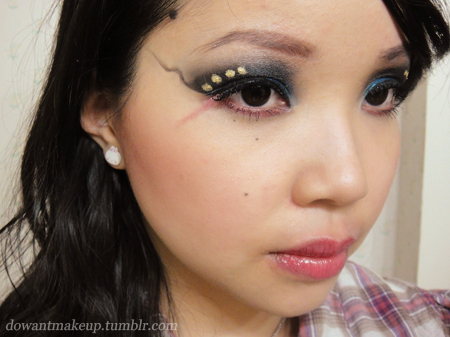 from the Mineral FX collection. My camera had a hard time capturing the finish, but it is so luminous and absolutely stunning. Also, I apologize for my hand looking dry and gross. This past Saturday, I met with some of the ladies from the Vancouver Beauty & Lifestyle Bloggers Network for afternoon tea! 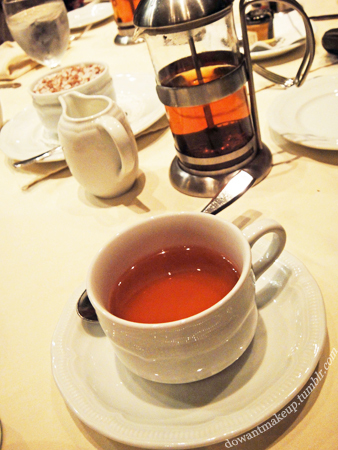 We had some delicious tea, sandwiches, and pastries at Bacchus Restaurant in the Wedgwood Hotel downtown. 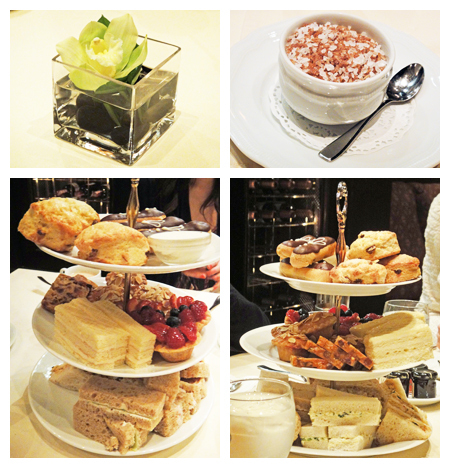 This was my first-ever afternoon tea; everything was so small and cute and elegant. I had a great time and got to know some really lovely Vancouver-based bloggers. 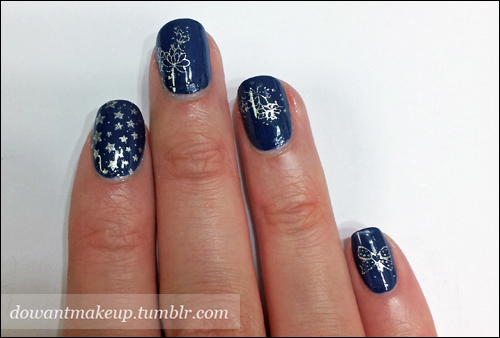 This nail post is a little different from usual. 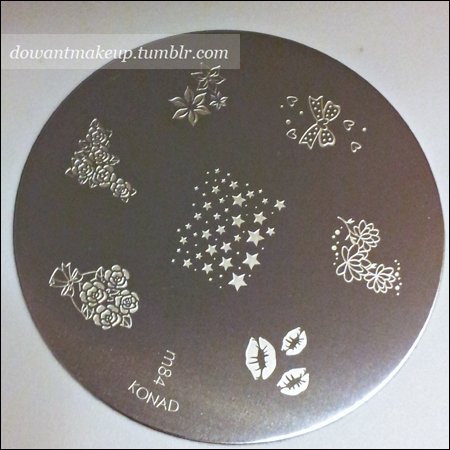 Recently I was sent a Konad plate, courtesy of Nail Polish Canada, to try. Since m84 is one of the newest plates from Konad, I thought I should give the full lowdown on this uber-girly stamp plate. 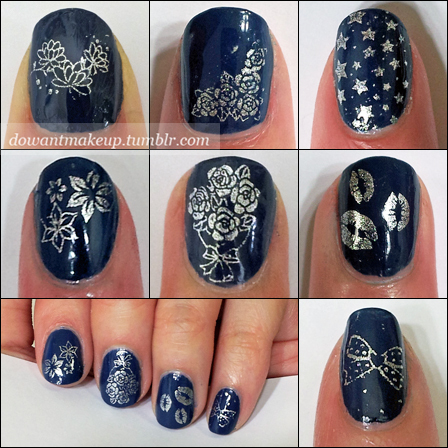 m84 is a pretty versatile plate of 8 designs: 1 full-nail stars design, 4 florals (roses, lilies, and lotuses), 1 bow with hearts, and 1 lip print. You can see that some of the designs stamped more successfully than others. The hearts in the bow design (bottom right) didn’t really show up. I was looking forward to the lotuses but as with any delicate design, you need a lot of patience as it’s difficult to get the polish into all the fine lines and stamp it on without any little bits missing. I fudged my right middle and ring fingers (pictured below), but I lucked out and stamped my left thumb (top left) almost perfectly. 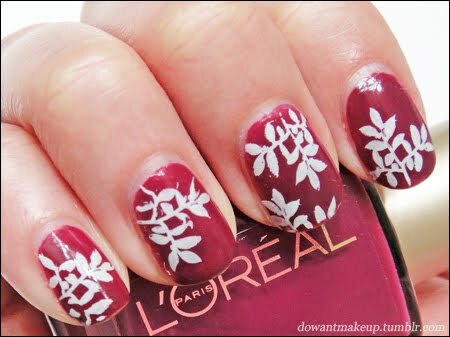 Designs like the lilies, roses, and lip print stamp easily and beautifully because it’s easier to scrape the polish into the larger engraved spaces. m84, along with m85, are among the newest Konad image plates. You can find them at Nail Polish Canada for $8.75 and free shipping within Canada. 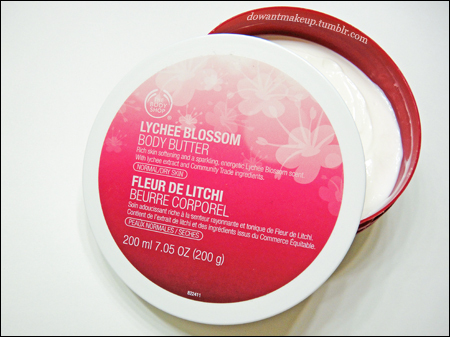 They also carry a number of nail polish brands and their most recent collections, as well as (Canadian girls take note!) brands that I’ve heard are tricky to find in Canada, such as Zoya. 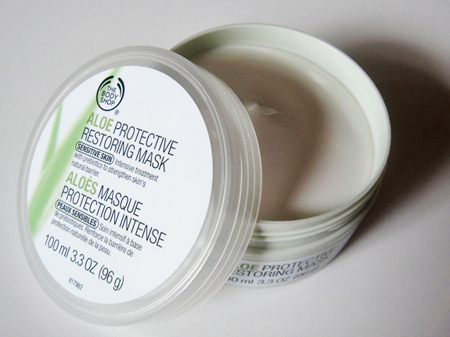 If you would like to see more posts describing image plates in detail, let me know!